The very name 'Thanksgiving" implies an action - the giving of thanks. As the children of God, through faith in Jesus Christ, we should be willing and eager to offer thanksgiving unto our God. As New Testament saints, we should have the will to offer the sacrifice of praise. This Thanksgiving, may we offer at our own will the sacrifice of praise unto the Lord, "the fruit of our lips giving thanks unto his name"! Thanks be unto God that this life is not an end in itself! We who are His children through faith in Christ Jesus have a good hope of the future! Imagine...a thousand years to live on this earth in a perfect, sinless body - and in the company of our Lord and our fellow saints. This is something to look forward to! Revelation 20:6 Blessed and holy is he that hath part in the first resurrection: on such the second death hath no power, but they shall be priests of God and of Christ, and shall reign with him a thousand years. As we approach the Thanksgiving holiday this year let us thank God for the blessings in store for us. The blessings of the past are great and surely we should thank Him for them, but we have much in the future to thank God for as well. We really are blessed and privileged to know so much about our future with Him! My ham and lentil soup. I haven’t done a link post for awhile, and since I’m a little behind on posts I thought I’d try to put one together today. It’s a cloudy, dull November day here (though not cold yet), but we had a little rain which is always welcome here these days of drought! Praise the Lord for every bit we get! Homemade Soup Recipes – Mmmm soooooup, that warm comfort food that makes a cold day seem a little less chilly. Did someone say chili? A chili for every taste – more or less. An assortment of Winter Dinners. 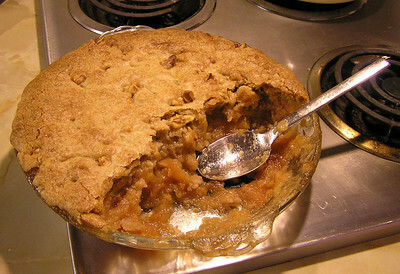 Apple pie dish – for a yummy winter treat, serve warm with a scoop of vanilla ice cream.